A 175-car train traveling from Cumberland, Maryland to North Carolina derailed in Northeast D.C. 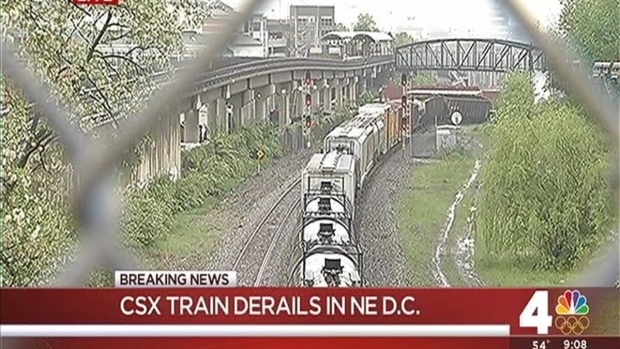 Residents in the Washington, D.C. area have been warned to prepare for a potentially slow commute Monday after a CSX freight train carrying hazardous material derailed near a Metro stop, sending 14 cars off the tracks and spilling hazardous material. The train derailed about 6:40 a.m. near the Rhode Island Avenue Metro station, according to CSX. 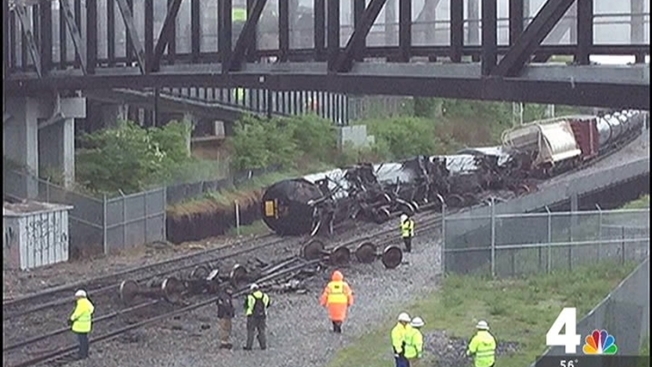 Sodium hydroxide leaked from one of the derailed tanker cars, CSX spokeswoman Kristin Seay said. The tanker was carrying 15,500 gallons of the chemical; fire crews believe about half of that leaked onto the rail bed and ground underneath it, D.C. Assistant Fire Chief John Donnelly said. News4's Derrick Ward and Darcy Spencer cover the impact of a train derailment in Northeast D.C. and the issues is could cause for your Monday morning commute. The rail cars that did not derail have been moved to a staging area and crews are expected to work throughout the night to pump out the remainder of the sodium hydroxide from the tanker. Sodium hydroxide is a highly corrosive chemical that can irritate and burn the skin and eyes, according to the CDC. There is no estimate of how long it will take to clean up the spilled chemicals and upright the derailed trains, a spokesperson for CSX said at a news conference Sunday evening. ``We understand that this a significant inconvenience to commuters and to this community so we're working as quickly as we possibly can with safety as the first priority,'' CSX spokeswoman Melanie Cost said. Doug Buchanan, a spokesman for the D.C fire department, said as many as nine and as many as 11 cars have derailed and at least three are leaking hazardous material. Another derailed tank car was leaking a non-hazardous calcium chloride solution. Common applications for the chemical include brine for refrigeration plants, ice and dust control on roads and the removal of water through chemical means. A third derailed car was seeping ethanol from the base of a valve, Seay said. Officials worked to re-seal the valve, and the spilled the ethanol has been contained. Donnelly said there was no danger to the public, and any fumes from the chemicals should not be a problem. D.C. Mayor Muriel Bowser said no trains will be officials have seen no issues with air or water quality. News4’s Mark Segraves reported an underground gas line was also ruptured during the derailment. Gas was turned off, and it is unclear how many people were affected by the closure. 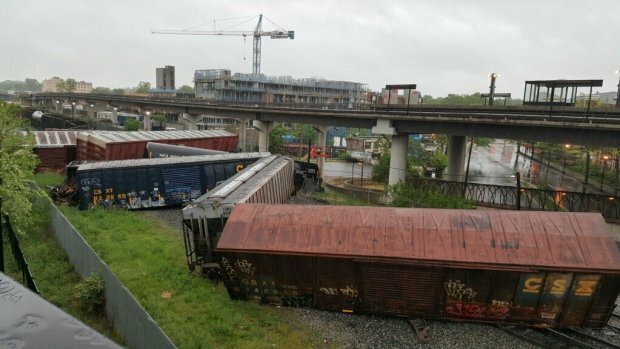 CSX Train Derailment in D.C. Emergency crews set up a wide perimeter around Rhode Island Avenue and the road was shut down for a time after the derailment. Rhode Island Ave. remains closed between 4th and 12th streets and the Rhode Island Avenue-Brentwood Metro Station is closed. Metro service on the Red Line was suspended between the NoMa and Brookland stations. Metro said it expects service to be back to normal by 5 a.m. Monday. Crews were inspecting the tracks, which are used by CSX, the MARC commuter rail system and Amtrak. The Metro tracks are above and adjacent to the derailment site. MARC service on the Brunswick Line, which runs from Washington to Brunswick, Maryland, with continuing service to Martinsburg, West Virginia, uses the tracks where the train derailed. "Trains are very unlikely to operate past Silver Spring," MARC said in a statement. Amtrak's Capital Limited service, which runs daily between Washington and Chicago, is currently unavailable. Two people were onboard the train, an engineer and a conductor, but neither was injured, officials said. It was not immediately clear what caused the derailment of the train, which was traveling from Cumberland, Maryland to Hamlet, North Carolina, when it derailed near 9th Street and Rhode Island Avenue. The train has three locomotives and 175 total cars, including 94 cars loaded with freight and 81 empty cars. @nbcwashington@shomaristone Just watched a freight train derail outside of my window near the Rhode Island @wmata station. Crazy! Photos tweeted by D.C. Fire and Emergency showed cars in a zigzag line across the tracks. "I thought it was like a semi-truck coming toward the building, and when I looked out the window, I saw cars piling up," said Nellum, who had just moved in the night before. "So I'm not even used to hearing trains. It was jarring." Bowser said the Federal Railroad Administration would be the lead investigators into the derailment.